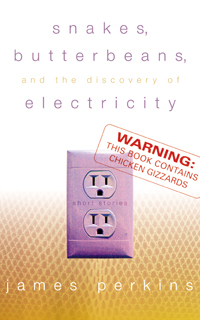 The touching, humorous stories of a Kentucky childhood James Perkins With the frankness of a memoir, each story in Snakes, Butterbeans, and the Discovery of Electricity explores the reaches of innocence amid a Kentucky childhood. Simply, plainly, directly, the narratives construct Four-eyes’s young world as he navigates a deeply Southern, deeply real existence as a boy in the 1940s. In “The Homecoming,” Four-eyes’s uncle has returned from World War II a quiet and shaken man, a casualty unlike any the young boy expected. Four-eyes and Billy discover that the distance between imagination and reality can be disappointing in the story “Gangbusters.” In “Fireworks,” the allure of pranks fades as the boys learn the costs of cruelty. On a dare, Four-eyes enters the house of the mysterious midgets at the end of the alley behind his house and finds much more than he bargains in “Four-eyes and the Midgets.” Nolstalgic, funny, and touching, this collection reminds us of the forgotten paths and pitfalls of childhood. In the fashion of the truest Southern storytellers, Perkins, in Snakes, Butterbeans, and the Discovery of Electricity asks us in, invites us to stay awhile, and to listen.